When choosing a frame shop it is wise to consider not only what techniques and materials will be used but also, who will be handling your artwork. Experience and skill level is what truly defines each frame shop and ultimately determines your satisfaction with the finished product. It is for this reason we celebrate our 30th year in business and combined experience of over 170 years. Todd Putnam started Framing Resource in 1989. He has over 40 years of experience with fine art and custom picture framing. He majored in art and minored in business at Oregon State University. He transferred to Pacific Northwest College of Art in Portland, OR to study printmaking and photography. 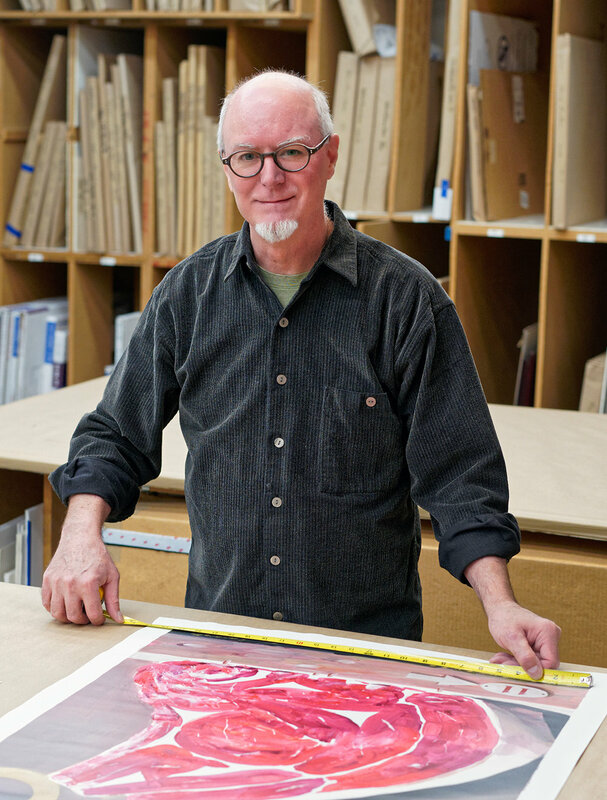 While at PNCA he worked at the Portland Art Museum for Dr. Gorden Gilkey, curator of prints and drawings. Under the tutoring of the PAM conservators, he learned conservation techniques for matting and hinging fine art. Additionally, has done curatorial work and new acquisitions for US Bank’s growing art collection and, worked at Photo Art Studios as a custom printer. Steve Amato is a native of New Jersey. He holds an MA in Museum studies from Cooperstown Graduate Program. He has over 20 years experience in picture framing. He has worked in galleries and frame shops both in here and in Akron Ohio. Additionally, he worked in the Morgan Library & Museum and the South Street Seaport Museum in New York. Mark Montoya is a native Oregonian and has been involved in the Portland arts and framing industry since 1999. At 20 years old he had his professional picture framing and design certifications. From installing large art exhibitions to designing framing treatments for entire collections, being a part of the creative community and assisting artists in presenting their portfolio is a passion that Mark has tried to emphasize in his work. Mark is currently managing production for Framing Resource and has truly turned his passion into his career. Chris Mullins is a native of Tennessee. 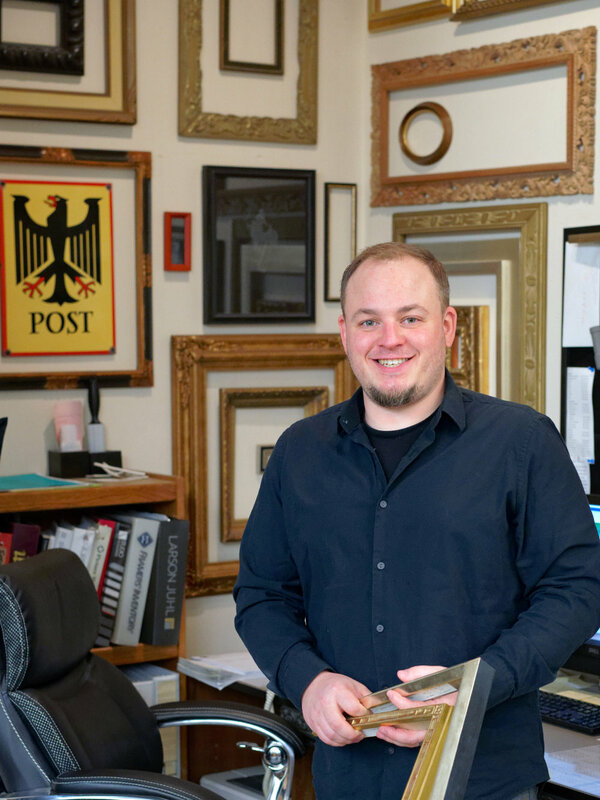 He has over 15 years of experience in fine art framing, matting and conservation techniques specializing in hinging works on paper. He graduated in 2009 from Pacific Northwest College of Art with a BFA in painting. He continues to produce his own work and curates shows locally. Bill Herbert studied industrial design and photography at Ohio State University. He has 36 years of custom framing experience going back to 1983. He moved to Denver in 1984 and continued on to Portland in 1989, all the while framing, handling art installations and creating his own art. He has held positions at the Oregon College of Art and Craft, as a preparator with the Portland Art Museum, as well as framing at several respected local frame shops. He has been with Framing Resource since 2001. Bill continues to pursue his own artwork combining found objects and his woodworking skills to create furniture, lighting and sculpture. He is always open to a good beer and lively conversation. Bernard McKenna earned his illustration degree from New York City's Fashion Institute of Technology in 1997. He has been a professional caricature artist and picture framer for over 16 years. 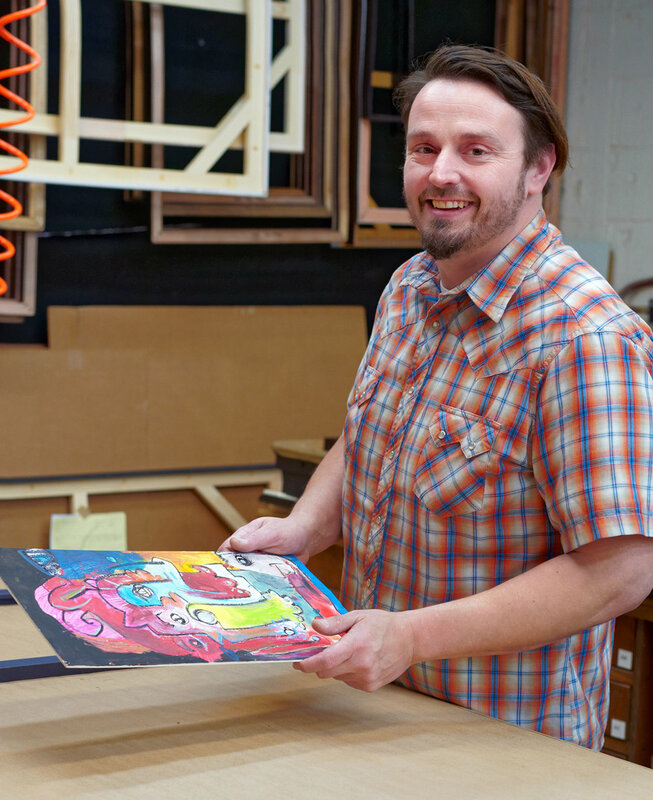 He's proud to say he's handled and framed art in frame shops and galleries from San Francisco to Baltimore. Finding his new home in beautiful Portland, Bernard feels very fortunate to be part of this very talented and knowledgeable Framing Resource crew. 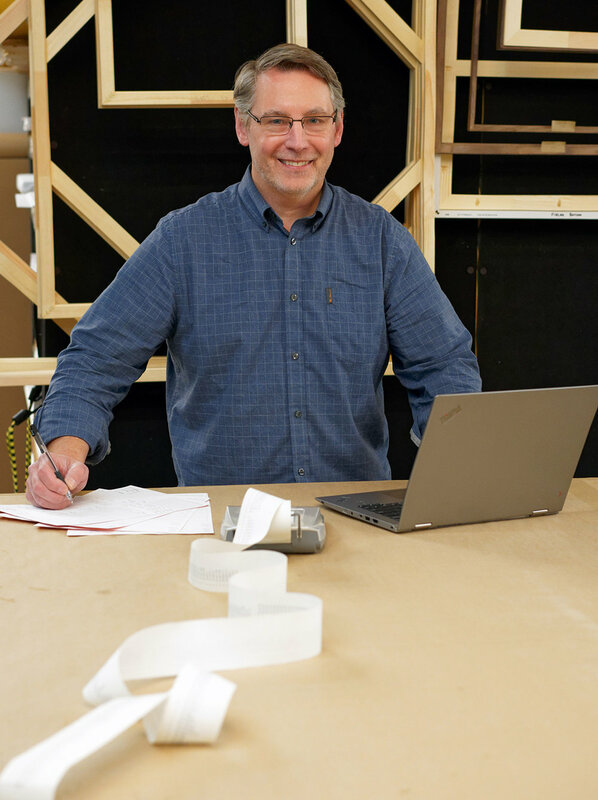 Devin Schell has been with Framing Resource for over 23 years. He has 33 years of custom framing experience. Devin has a background in woodworking and custom cabinetry. In his spare time he enjoys restoring and showing vintage cars and is passionate about fishing.